The military seems to adore President Trump and he did not forget them on this Independence Day. In fact, he made them the focal point of his Fourth of July address. It was vintage Trump and those watching and in attendance ate it up. 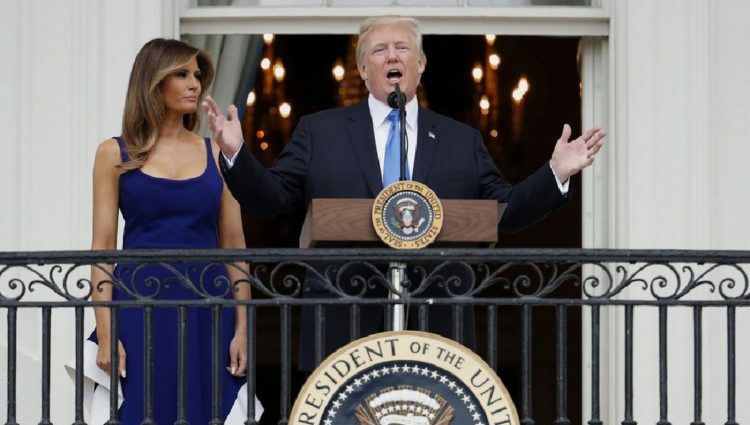 He spoke from the White House balcony with beautiful First Lady Melania at his side and it was a perfect red, white and blue moment. The speech was reminiscent of Reagan when he brought the pride of the military back to our country. Trump declared that he would always have the military’s back. It was a short speech that did not address the imminent threat of North Korea… that’s another conversation we are all going to have to have this week. Yesterday, was all about celebrating America and her heroes. Each branch of the military was in attendance for the speech. The president addressed individual members of each of the service branches who had gathered outside in early evening for his first Independence Day address before the annual fireworks celebration on the National Mall. I may not always agree with President Trump, but it is certainly refreshing to have a Commander-in-Chief who honors, respects and loves the military the way he obviously does. Not only that, but unlike Obama, Trump truly does love this country. I have no doubt whatsoever about that. Where was Obama during all this? Well, he was violating the Logan Act in South Korea, trying to undermine President Trump on the eve of war with North Korea. Totally predictable. President Trump boasted that the country is doing very, very well and that we are on a strong footing as a nation. From Trump: “And I want to just tell you that our country is doing really, really well no matter where you look. The economy is blazing and on every front we are doing well,” Trump said. “And we do have challenges but we will handle those challenges, believe me.” Some say that alluded to action on North Korea this week. Let’s hope that is correct. In the meantime, this was a wonderful way to celebrate our nation’s independence… at long last a truly American celebration after eight long years of self-loathing.